Usually the things I manage to find as Free GM Resources have been around a while. Sometimes I'm just late to the party, and other times it might be a goodie just hidden away and forgotten about on the interwebs. 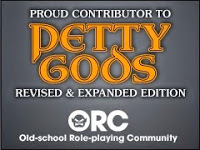 I'm pretty certain this is a brand-spanking-new resource that will benefit a whole group of RPG Gamers, specifically those that play online with a Virtual Table Top (VTT). 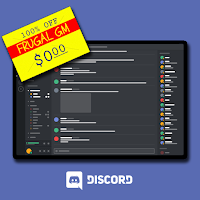 Discord is a free all-in-one voice & text chat program that essentially replaces the need for a Ventrillo or Teamspeak account. Now I know some folks use Google+ hangouts, and if that works for you, great. Personally I always preferred using a Ventrillo server because the quality was so much better. Discord looks like it is built from the ground-up to work for gamers with an easy-as-heck interface that uses minimal bandwidth. I like the fact it'll work with mobile devices and even has a game-overlay feature you can pop on & off as needed. You don't need to download the client, but it looks like things can run smoother if you do. I'm just getting into playing with Discord, but I think this will work great for my future online gaming plans.